Share James Gaiters MUV-MeNT's EPK! James Gaiters, Jr. was born in 1968 in Columbus, Ohio and began to play drums at the age of four, influenced by his mother who was a concert pianist and also the church organist for his father who is a pastor. His jazz experience began through his “secret rendezvous” with Stanley Clarke, the Yellowjackets, Billy Cobham, Koinonia, and Chic Corea. He later discovered the stylings of Wynton Marsalis, which prompted deeper investigation into the jazz art form. During his youth, James played in various school and local bands, studying many styles of music. He then went on to college to study architecture. Musically, this move proved to be the best move of his swiftly growing career. 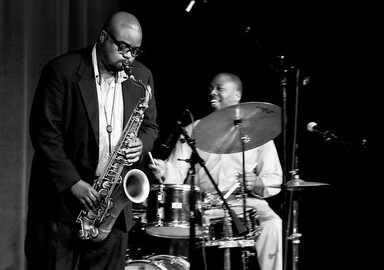 In late 1994, James began playing in the Ohio State University Jazz Ensemble, and later met Edwin Bayard, a student, and also tenor saxophone player at Ohio State University. This proved to be the launching pad for one of the greatest musical unions. His first major break onto the circuit was to join up with jazz trumpeter, and MoJazz recording artist, Pharez Whitted with who he has toured the country extensively. Throughout his powerful and favorably blessed career, James has appeared with many of the world’s greatest artists. James has been a featured performer with Wynton Marsalis at New York’s world renowned Village Vanguard. He has received accolades the world over as he was featured on a world tour with RCA/Victor recording artist D. D. Jackson. James’ powerfully musical voice has also led to nationally and internationally televised features on BET on Jazz (Jazz Central, Knitt TV), BET (Jazz Central), a Jazz Documentary in Tokyo, Japan, and an educational feature for TV ONTARIO. James has also been featured on some of the world’s most prestigious jazz festivals, such as, THE NEWPORT JAZZ FESTIVAL, OTTOWA JAZZ FESTIVAL, TORONTO JAZZ FESTIVAL, DU MARIER MONTREAL JAZZ FESTIVAL, JVC JAZZ FESTIVAL (SARATOGA), BELL ATLANTIC JAZZ FESTIVAL, INDIANAPOLIS JAZZ FESTIVAL, DETROIT MONTREUX JAZZ FESTIVAL. James is an annual feature, with his own band, on the COLUMBUS JAZZ AND RIBS FESTIVAL in Columbus, Ohio. As well, James has been featured with the likes of Frank Foster, Andrew White, David Murray, Donald Walden, James Carter, Wessell “Warmdaddy” Anderson, Joey DeFrancesco, Mulgrew Miller, and Jimmy Smith, just to name a few. His divine musical gifting has also allowed for him to share the world’s stage with a who’s who of celebrities, spanning from Neena Freelon to James Earl Jones, to the one and only Dr. Bill Cosby. As an expanded display of his versatility, James has toured nationally, and internationally with New York based musician/actor/poet, David Gonzales and his off-Broadway production, MYTHOLOJAZZ, appearing in major theaters, venues, and universities around the world. James has been featured, along with his band MUV-MeNT, as a part of AFRICAN PORTRAITS; an amazing musical celebration of African America’s contribution to the world of art through music, composed, produced, and performed by world renowned composer/musician, Hannibal Lokumbe. He has also contributed to the recorded works of several national recording artists in both the gospel music and jazz scene. James is most definitely on the list of tasteful drummers with his musicality, finesse, and power; always contributing to a greater effect. 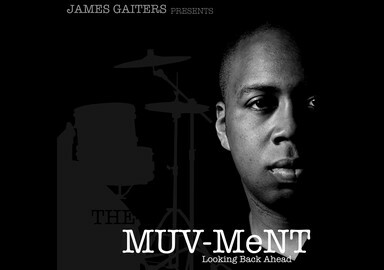 In addition to his incredible contributions as a sideman, James Gaiters, Jr. is a prolific composer, arranger, and producer, and has written, produced, and released LOOKING BACK AHEAD, a CD featuring his own group, MUV-MeNT. This recording features Edwin Bayard/Saxophone, Lovell Bradford/Piano, Rodney Whitaker/Bass, Derrick Gardner/Trumpet, and Wessell “Warmdaddy” Anderson/Alto Saxophone.